Lance Hookano was fishing with his partners Ryan Tamanaha, Kurt Lum and Brian Araki at their favorite spot on the North Shore of Oahu in late November when he made his historic catch. After four days of fishing, Ryan convinced Lance to rig his baitcasting pole--an 13-foot Outcast mated with a Newell 454 reel loaded with 60-lb test--with the head of a tohei Ryan had caught. 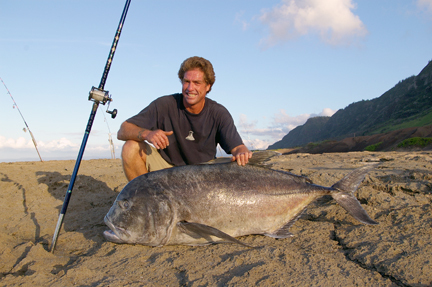 At 4 a.m., Lance's pole took a huge strike and he eventually landed the fish of his dreams, a 119.6-lb white ulua.